Husker Du generally get a ton of credit for releasing 3 of the greatest rock/punk records of the all-time in the span of a year and a half. This curmudgeon would have to agree. While Pollard's newest vehicle, Ricked Wicky, won't be winning such accolades anytime soon, they've out Guinness-Booked themselves in the year 2015. With the release of Swimmer to a Liquid Armchair, Ricked Wicky have unleashed their third LP in just over 7 months! While Pollard is no stranger to multi-albums per year, some in the same month (or day for that matter) rarely has Pollard released 3 full-length LPs under one moniker in a year (see GBV 2012 reunion records for more exercises in the prolific). As with King Heavy Metal, this LP plays out like a band continuing to grow, while embracing an understood centralized cohesion. With 2015 in the books for Ricked Wicky, one can classify their albums as such: I Sell the Circus is the fairly solid, but uneven introduction. King Heavy Metal, the comfortable and exciting plunge into the weird. 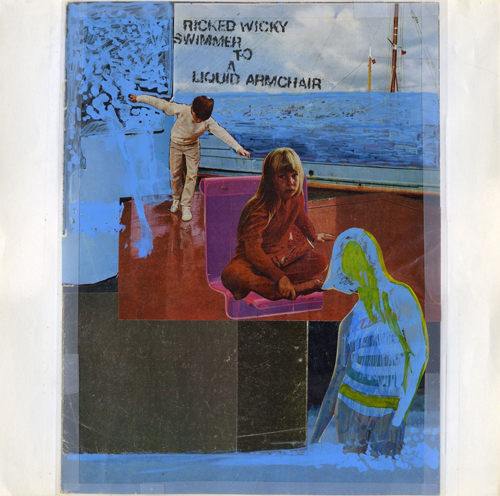 Swimmer to a Liquid Armchair, the most coherent, and possibly a loose concept album. While their may not actually be a concept here to speak of, Swimmer to a Liquid Armchair follows one centralized mood throughout. Overall, it is not a bright album. There are few great hooks, and scant "GBV" moments to fall back on. At times, the album could feel like another pile of songs, but this one's a grower. Looking past, and digging deeper, it proves to be another strong outing by Pollard and his supergroup on a prolific reawakening and hopeful surge forward. Primarily recorded at Cyberteknics in Dayton by Phil Mahaffey, sans Nick Mitchell penned/sung tracks, the record features the sonic palate found on recent GBV and Pollard solo releases such as Cool Planet and Faulty Superheros. What Are All Those Paint Men Digging?- 5 This multi-layered opener really sets the tone in terms of mood and prog standards. Humdrum acoustic opening bursts into incredible start-stop action. “Hands, feet, motor skills,” section is sing along worthy for any future show. More first raising sections come and go interspersed by acoustic interludes all under 3 minutes. WOW! Crystal Titanic- 3 Prog guitar and drum stabs give way to poppier moments throughout this song, over and over, never getting a proper footing to leap above the rest. Pollard almost sounds out of tune, but is actually giving a pretty strong (albeit) strange vocal performance. Not bad, just never seems to find its focus. Tip of the hat to that interesting “string” interlude, one might add. Poor Substitute- 5 The first of 2 singles off the record. The verses are decent, but that guitar sound is thinner than a receding hairline. Similar to a mid-00s Pollard solo track from one of the Merge Records outings. However, the ending is incredibly simple, effecting, and emotionally assaulting. Not to mention, this is perhaps Pollard's most honest and heartbreaking song in years featuring some of his best lyrics. Blind Side- 1 Baffling. Guitarist Nick Mitchell's first of 2 tracks on the record. After a number of incredible, thought provoking, and ambitious B-sides, Mitchell's contributions to the LPs continue to be cheese worthy bar rock full of hackneyed guitar pulls and dated vocal stylings. Is Pollard sabotaging this poor guy by rejecting the good stuff? A Number I Can Trust- 2 The second of 2 singles released off STALA, In regards to being named a single, this one misses the mark. Song shows the most promise mid song, shifting tempos. However, repetitive drab lyrical sections of “new times baby boy,” and “you can come..” really drag this potentially interest piquing track through the mud. Also, never seems to end, as we're left with an instrumental section that ultimately leads to zero payoff. Simple Simon Paper Plates- 3 This track's akin to some Moses on a Snail material. So goddamn dreary and cold, it's pretty spectacular. A total mood piece. Repetitive guitar line drags on over tom rolls. The choruses fail to add much though. Appreciated more for it's dower glumness more than anything. Red Legged Pygmalion- 2 More annoying than impressive, this side-opener's mainly carried by a shrug-worthy guitar riff, jilted drum fills, and Pollard trying, awkwardly, to match it vocally. The chorus sounds a bit like some Quadrophenia song section I'm dying to place. Pollard finishes it off by repeating “and one eye hurts, the only one” about 38 or 400 times? Lost count. (although that's a great line)..
No Man Would Develop- 4 The most confounding track of the bunch. Might take a while to stick. At first, the guitar stabs and long pauses into cliffhangers feel fruitless. However, the song begins to gel in the mid section, before traveling back into a proggy puzzle piece. The most King Heavy Metal track on here. Plastic Oceanic Getaway- 3 Nick Mitchell's back for his second foray on the LP. This one sounds like a Rush track. Everyone's thinking this. Not nearly as cheesy as “Blind Side,” but still out of place on the LP. Fact: features the LP title in the lyrics. Speaking of lyrics, has any songwriter combined such gag-worthy lyrics in the same track alongside such surreal lyrics of brilliance? Oh yeah, probably Robert Pollard. The Box (Including "The Curse")- 3 Under 2 minute postpunk exercise in the mundane. The verse features a simplistic but mildly grating Pollard vocal melody over killer bass tone and stomping drum rolls... Pretty cool song concept comes out of this potential forgettable throwaway as the lyrics “I ask you please to close the box...” is followed by somewhat of a conceptual radio play moment meets studio trickery 101.... Hear it to believe it. Could I See the List One More Time- 4 Schmaltzy, unoriginal, but super effective. A song that offers up moments of inner reflection and nostalgia. This is middle of the road material we've been down many times but this one works for the better. Only gripe, wish Pollard would have thought up some additional lyrics for that chorus. Hear it to believe it. I Am a Coastal Guard- 3 Acoustic closer with guitar ambiance popping in. Pollard sounds like he's out to sea in his own private echo chamber. A somber, reflective closer that's willing to let a little light in. Eventually, the acoustic moment of interpersonal reflection gives way to an all out mid-tempo, melancholy instrumental bash. End scene. Hear this LP to believe it.